The Ness of Brodgar is an archaeological excavation covering an area of 2.5 hectares in the Heart of the Neolithic Orkney World Heritage Site, in Scotland. It has revealed a well-preserved and sophisticated complex of monumental stone buildings, enclosed by walls that are six metres thick. Built and occupied by people over 5,000 years ago, the Ness has produced decorated and painted stonework unlike any other site. Its architecture is unique and it has given us evidence for stone-tiled roofing as never previously understood. But excavation on this scale is expensive. Each season costs £200,000, covering both the digging period and all the ensuing work by an amazing array of specialists in labs, on computers processing vast amounts of data, and making close examination of the thousands of pieces of information we excavate each year. 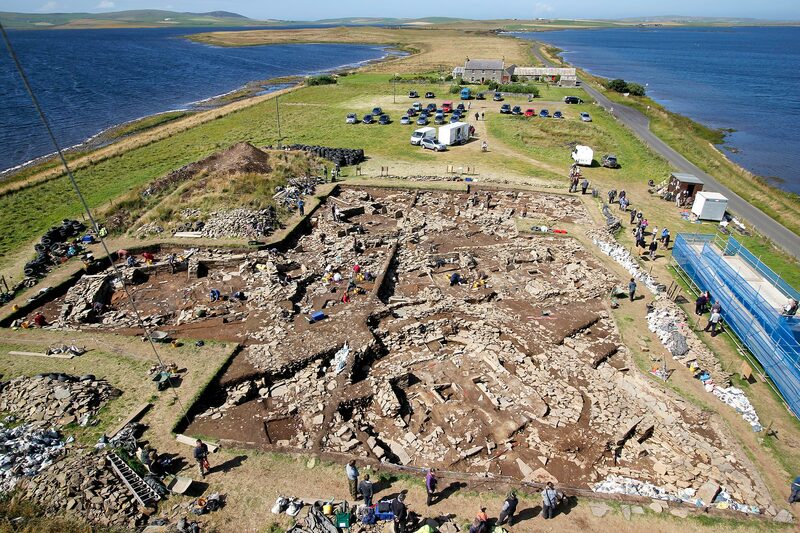 The Ness of Brodgar Trust is a Registered Scottish Charity No: SC044890. The Charity’s primary aim is to foster public awareness of the Ness and to fund this excavation into the future. Please help us to provide financial support for the archaeological excavation and research being conducted at this internationally acclaimed 5,000 year old Neolithic complex.